If a production is Suspended or Troubled, see “Correcting Production Problem States,” in the next chapter. To access this page in the Management Portal, select Interoperability, Monitor, and System Monitor. This page displays tables of information, described in the following subsections. Also see “General Notes,” earlier in this chapter. Productions Running  Number of productions that are currently running. Productions Suspended or Troubled  Number of productions that are currently suspended or troubled. Incoming Messages in Last 30 Seconds  Number of messages received by business services in the last 30 seconds. Last Incoming Message  Date and time of last message received by any business service. Outgoing Messages in Last 30 Seconds  Number of messages processed by business operations in the last 30 seconds. Last Outgoing Message  Date and time of last message processed by any business operation. Total System Processes  Number of system processes that are currently active, including processes that are not specifically associated with productions. If you click Total System Processes and then click the link at the bottom of the page, InterSystems IRIS displays the System Operation > Processes page. For information on this page, see “Controlling InterSystems IRIS Processes” in the chapter “Managing InterSystems IRIS” in the System Administration Guide. Active Production Jobs  Number of production jobs that are currently active. Visiting Production Jobs  Number of jobs outside of production that are currently invoking InterSystems IRIS code. Most Active Processes  Displays a table of the processes that have the highest number of recently executed commands, across all namespaces, including processes that are not specifically associated with productions. PID is the process ID, and Commands is the number of recently executed commands. Also see “Diagnosing Problems with Jobs” in the next chapter. This table provides the same information as in the System Time table of the System Operation > System Dashboard page. See “Monitoring System Dashboard Indicators” in the chapter “Monitoring InterSystems IRIS Using the Management Portal” in the Monitoring Guide. If you click a row in this table and then click the link at the bottom of the page, InterSystems IRIS displays the System Operation > System Dashboard page. This table provides a subset of the information in the System Usage table of the System Operation > System Dashboard page. See “Monitoring System Dashboard Indicators” in the chapter “Monitoring InterSystems IRIS Using the Management Portal” in the Monitoring Guide. Active Queues  Count of currently active production queues. Most Active Queues  Displays a table of the queues that have the largest number of unprocessed messages. In this table, Messages is the count of messages in the given queue. Also see “Diagnosing Problems with Queues” in the next chapter. Serious System Alerts  Number of serious system-level alerts that have been raised. Production Alerts  Number of serious Production alerts that have been raised. Production Errors  Number of application errors that have been logged. For information on configuring a production to send alerts, see “Configuring Alerts” in Configuring Productions. This table provides the same information that is shown in the Licensing table of the System Operation > System Dashboard page. See “Monitoring System Dashboard Indicators” in the chapter “Monitoring InterSystems IRIS Using the Management Portal” in the Monitoring Guide. If you select a row in this table and then click the link at the bottom of the page, InterSystems IRIS displays the System Operation > License Usage page Summary. This table provides the same information that is shown in the Task Manager table of the System Operation > System Dashboard page. See “Monitoring System Dashboard Indicators” in the chapter “Monitoring InterSystems IRIS Using the Management Portal” in the Monitoring Guide. If you select a row in this table and then click the link at the bottom of the page, InterSystems IRIS displays the System Operation > Task Manager > Upcoming Tasks page. The Enterprise Monitor displays the overall status of multiple running productions. These productions can be running on different namespaces within the same instance of InterSystems IRIS or can be running on multiple instances of InterSystems IRIS. You can display the Production Monitor or the InterSystems IRIS Management Portal for any of the productions being monitored. The monitored productions can be running in different namespaces on the same InterSystems IRIS instance, running on multiple InterSystems IRIS instances on the same system, running on multiple systems, or running on any combination of these. Create a namespace for the Enterprise Monitor or choose to use an existing namespace for it. The following steps are done in this namespace. Define credentials that provide access to the systems that you will be monitoring. Configure Enterprise Systems, defining a new connection for each system that you are monitoring. Optionally, specify a queue threshold for each system. For details on configuring Enterprise Systems, see “Identifying Enterprise Systems for Viewing and Monitoring” in Configuring Productions. In Studio, open the class that defines the production running in the Enterprise Monitor namespace. 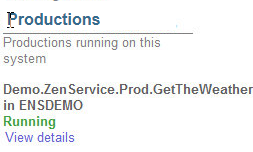 Add the Ens.Enterprise.MonitorService business service to the production and enable it. Select Interoperability, Monitor, and Enterprise Monitor to display the Enterprise Monitor. Note that this menu item is only visible if you have configured Enterprise Systems in the current namespace. Bar graphIndicates the status of the configuration items of the production. The green, red, and yellow indicate the percentage of the items in each state. Green indicates the items that are active and running correctly; yellow indicates the items that are inactive; and red indicates the items that have encountered an error. If you hover over the bar graph, the pop-up text displays the number of items in each state. Client NameName defined when configuring Enterprise Systems to identify the system in the Enterprise Monitor. QueuedSpecifies the total number of messages currently waiting in queues. If you have set the queue threshold and the number of messages exceeds the threshold, the number is displayed in red. If the number exceeds 85% of the threshold, it is displayed in yellow. If the number is below 85% of the threshold, it is displayed in green. If no threshold is specified, the queue number is displayed in black. StatusIndicates the status of the productions: running, stopped, suspended, or troubled. Production NameDisplays the production name. If you click on this link, the Enterprise Monitor opens the Production Configuration page on this system. System SpecsDisplays the system name and namespace of the system. If you click on this link, the Enterprise Monitor opens the InterSystems IRIS management portal on the system. Start TimeDisplays the date and time that the InterSystems IRIS instance was started if it is currently running. UpdateReasonSpecifies the reason that the production configuration was last updated. WebIPAddressSpecifies the system name and port number. NamespaceSpecifies the namespace of the system. If you click on an item in the Enterprise Monitor that is not a link, the Enterprise Monitor displays the production monitor for that system. For information on the Production Monitor, see Monitoring a Production. Enterprise Monitor Roles allow you to limit the production components that are visible in the Enterprise Monitor based on the roles of the current user and the categories specified in the production configuration for the component. When a user displays the Enterprise Monitor, it checks if the user has any roles specified in the Enterprise Monitor Roles. If none of the roles match, the Enterprise Monitor displays information about all the components in the productions. If one or more of the roles match, the Enterprise Monitor displays information about components that have one of the specified categories. To add a new role, select New Role. To edit or delete a role, select “edit” or “delete”. When you enter the role and category, the form does not list the existing roles or categories. You must know these and enter them as text. Once you have entered a category, it is available as a check box when you add or edit a role. Ensure that the production in the namespace is running. You will get this message if it is not running. The production in the namespace must have a class that extends the Ens.Enterprise.Production class. If you create a new production using the InterSystems IRIS portal, it creates a production that extends Ens.Production. To fix this problem, edit the production in Studio and change the class that it extends. Then compile the class and stop and restart the production. Ensure that the production contains the Ens.Enterprise.MonitorService business service and that it is enabled.